This is our amazing Special Areas Team! 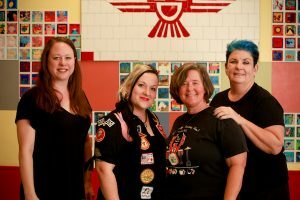 Besides teaching art, music, physical education, and library skills, these wonderful ladies support many of the special events that happen throughout the year at THES! Ms. Collins was born in Corpus Christi and grew up in Houston. She has lived in Austin since 1980. Ms. Collins has a B. S. from Stephen F. Austin State University and a M. Ed. from Texas State University. 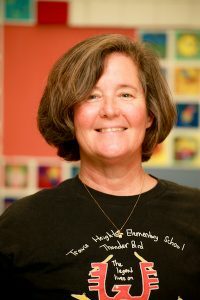 She has taught at THES since 2005. Ms Collins cares passionately about the wellness of the whole THES community: students, faculty, staff, and families. We are so grateful that every year she organizes our Family, Fun, and Fitness Days! If you would like to volunteer to help nurture the wellness of our community, please contact her. 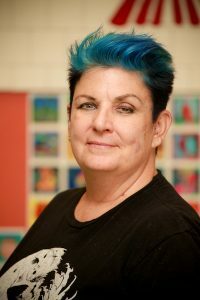 Ms. Isoline is our art teacher at THES. She grew up in Fort Worth. She moved to Austin in 1978 and raised her daughter here. Ms. Isoline first starting working in retail management and buying, but felt a calling to educate. 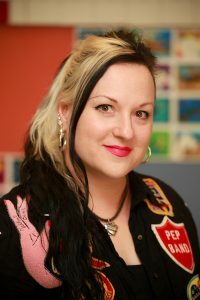 Her first teaching job was at the Austin State Hospital. In 1998 she joined the THES faculty, and has been here ever since! 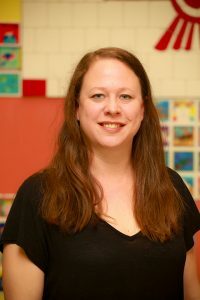 Along with teaching art at THES, Ms. Webb organizes an exhibition of student work at the Performing Arts Center, sponsors the Young Artists’ Day at THES and donates her time every year to help THES students participate in the Travis Heights Art Walk. Our beautiful artwork is displayed throughout the school all year long. Stop by and check out what our creative students have produced! If you care about art in the schools, and would like to volunteer, please contact her. I grew up in Richardson, TX (Dallas) I graduated from Richardson High School in 1993. I graduated from Austin College in Sherman, TX in 1997 with a Bachelor of Arts in Music with a minor in Psychology. I continued at Austin College to get my Master of Arts in Elementary Education in December of 1998. I began teaching music in January of 1999 in my home town of Richardson, TX at Prestonwood Elementary. Although I loved my school, I needed a change! So in 2006, I moved to Austin and began teaching music here at Travis Heights Elementary! Teaching Philosophy–I believe in teaching the whole child. Music is a way to tap into another part of the brain. I believe all students can learn music as long as they try hard and we work together! My curriculum is based on the Texas Essential Knowledge and Skills (TEKS) for Music. Through my curriculum, students will learn songs from both their heritage and many other heritages. They will be performers (both singing and playing instruments), critical thinkers, creative human beings, and listeners. Students in Kindergarten-3rd grade will sing using the Kodaly method and will play Orff instruments using the Orff-Shulwerk method. Students in 4th and 5th grade will learn to play the recorder and the guitar. Students in 3rd-5th grade will study composers and classic pieces of music through the Music Memory program that is used all over Austin ISD and around the country. I’m a Texan born and bred, but my world travel bucket list is alarmingly long. I received my Master’s Degree in Library Science and BS in Elementary Education from Texas Woman’s University, along with Reading and ESL Certifications. I have spent more than 20 years in education, and enjoy learning many new things daily. I’ve used a few musical bones in my body over the years, and broke just one of them during my 5 years skating with the Texas Rollergirls. I enjoy spending my time reading anything I can get my hands on, running, watching documentaries, searching for that perfect midcentury whatnot, and tackling awesome adventures with my family! Teaching Philosophy–I believe reading is a free vacation, an adventure, a door to other worlds and times, and an amazing opportunity to understand beyond experience. My life’s work is to create lifelong readers and independent library users, with a curiosity for the world in which they live. All children can love reading and evaluate information; they simply need a guide to route them through mazes of books and information to the gems they seek! I enjoy being that guide. The library curriculum is organically-based on foundational library skills, fun story times with award-winning, best loved books, reinforcement of classroom teaching, and rewarding texts with socially conscious themes.